When Capcom ported "Resident Evil 4" to the Wii, it seemed likely that "Okami" was next in the publisher's line of last-generation games to find new life on the Nintendo system. The highly praised PlayStation 2 game met with meager sales due to its arrival during the system's twilight years. On the Wii, a new and more attentive audience could discover "Okami" and give the game a rightfully warm reception. But what really beckoned "Okami" to the Wii was the game's unique style of play. Fewer game play elements are better suited to the Wiimote than the game's Celestial Brush - a directionally controlled ink brush with which players can slash at enemies, turn night into day or plant bombs simply by drawing on screen. On the PS2, these actions were accomplished by pushing an analog stick with one's thumb. So one would suspect that miming these strokes with a Wiimote would be much more fun. But "Okami's" controls don't work on the Wii quite as beautifully as the game's breathtaking art. Players can accomplish most brush commands with ease, but every so often an action takes half a dozen attempts to execute. The slash command in particular is sometimes a pain to achieve due to the difficulty of precisely waving the Wiimote in a straight lateral motion across a tree or an adversary. Most players will adjust to this problematic control within an hour of starting the 40-hour game, so it ultimately presents a minor hassle. Another control downgrade arises during combat, when wolf deity Amaterasu must rid the Japanese countryside of the demonic beings that haunt it. The hero's attack and dodge actions have been mapped, respectively, to flicks of the Wiimote and nunchuk. This scheme slightly slows the pace of the game's frequent battles - sometimes to the point of mental and physical tedium - from the button-mashing frenzy they became in the PS2 edition. These downsides to the Wii edition of "Okami" don't detract too heavily from what is otherwise a brilliantly inspired game. As the white wolf sun god Amaterasu, players must use the Celestial Brush to stop a plague of darkness that has beset feudal Japan. The muted Amaterasu travels the countryside with the motormouth Issun, a microscopic guide, to aid villagers and add new powers to the Celestial Brush in hopes of slowly repelling the curse of the eight-headed demon Orochi. The story is advanced with occasionally boring cut scenes - namely the 10-minute-plus opening - but the playful dialogue and absorbing characters that occupy Amaterasu's adventure liven up the interludes. "Okami's" Japan is presented in endlessly vibrant cel-shaded color that vivifies the setting to the point where players may feel content to simply run around as Amaterasu and take in all the graphic splendor. 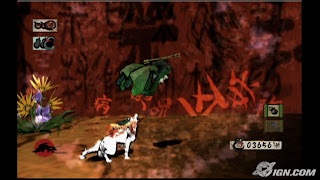 In this area "Okami" benefits from its adaptation to the more powerful Wii, which depicts the game's swirls and explosions of color and light in sharper graphic detail than the PS2. The wall of flame that encircles Amaterasu in battle is saturated with billowing textures and brilliant hues, while the water bodies and skies cool the screen with tranquil waves of blues. Between the aesthetic and the mythic sweep of "Okami," players may feel like they're participating in an epic cartoon of the finest artistic quality. Though the PS2 edition offers a somewhat easier control system, the game's glory is preserved well enough on the Wii to warrant another play-through. And those entirely new to the game would greatly enjoy picking up the brush. The final boss: The Wii incarnation of the PlayStation 2 masterpiece "Okami" deserves another play, despite trading smoother controls for more pristine graphics.